Amazing Snowmobile Season here in Ontario! Ah the crisp cold air of winter, blowing on your face as you speed across an open lake, or cruise through the thousands of kilometers of trails in the boreal forest of Ontario. 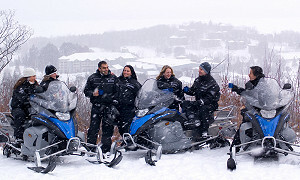 Snowmobiling is Canada’s pastime, and should be experienced by everyone who lives here at least once. For those of you who’ve caught the bug, we’ve created a list here of resorts that cater to the snowmobile market - either by being right on the trail, providing gas, having oil and tools available, or all of the above! With a winter forecast of heavy snow and long, deep cold, we’ve got our fingers crossed for an amazing snowmobile season here in Ontario! Bayview Wildwood is likely the closest resort to Toronto and a well known powersports haven. In the summer ATVers ride out of this incredible resort in the heart of the Canadian Shield, and in winter, sledders descend on their warm and friendly nook - and they often have weekend packages. Trillium has both cottages and chalets, and both are pretty incredible. There’s a 150km groomed trail system locally, and hot tubs and fire places for after the ride. Sled packages include breakfast and dinner. The resort is located just off TOP Trail D103B on HGR 55. 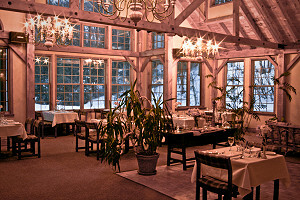 Long known as the home of the RAP or Round Algonquin Park tour, Spectacle Lake Lodge is dyed in the wool snowmobiling. The bar and restaurant serve delicious warming food and can cater to large groups easily. And there are hot tubs available for those who need to get the chill out of their bones. Trail 159 gives you direct access to the lodge. This great spot, in the wilds of Northeastern Ontario, practically guarantees snow - they’re that far North. The food is world-class and the service is nothing to sneeze at either. The Gold Rush tour is the local favourite, but there are plenty of local trails between here and Temiskaming Shores. Snuggled into the channel at Killarney and the North Channel is one of Ontario’s best kept secrets - a high-end resort with lots of repeat traffic, due to their incredible hosting. The Chiniguchi Tour Loop is right there, and breakfast and dinners are included so you don’t have to worry about that. The Bonnie View is a true historic inn, being founded in 1924. Ten minutes from town, its a winter wonderlands with lots of options for trails right out the back door - and you can also rent snowmobiles here from Back Country Tours. They also offer dogsledding experiences if you want to add something different to the mix! Good trail access, snowmobile rentals, guided tours and trails everywhere - if you want to catch up on a little ice fishing too, they can sort you out. If you’re an aviation enthusiast, check out Elmhirst. Sure they offer “free spirit adventures” and close access to the snowmobile trail just outside of Peterborough, but they also offer pilot training! Spa service and some of the best post-sledding relaxation in the highlands of Haliburton, Pinestone has secure sled parkingright on HCSA’s trail 7. This area has one of the longest continuously groomed snowmobile trail systems in Ontario, so you know the trails are good. Westwind offers something so other resort on this list can - its next to Gallery on the Lake, one of the biggest retail art galleries in Canada! Pick up something for the cottage, or your home, and have it shipped there! Sledders love Muskoka with its winding trails and great grooming clubs - Deerhurst is the perfect way to do these trails in style. The resort is on the TOP D102B and includes a restaurant and bar, as well as access to 2,000 km of trails in the direct area. There’s also sled parking and onsite fuel. Well known throughout Ontario as a one-stop-shop for family getaways, Blue Mountains is also perfect for sledders - with tons of great restaurants, bars and shops, its a great couples ride. There are snowmobile rentals here as well, if you want to start your trip here. District 8 and 9 trails are right out the back door. Home to a number of snowmobile rental companies, Sandy Lane provides sled delivery and discounted rated with trail access to the RAP, and the private trails in the Haliburton Forest. They also offer a shuttle to restaurants. Old Muskoka charm best defines this resort, two minutes—by snowmobile—to OFSC Trails 77 & 78 near D101B and D102B. The Norsemen Restaurant introduced their new menu in December 2017 and people are raving. Easily one of the top resorts in Canada, the Rosseau is only 2 hours from Toronto. This resort is not on the snowmobile trail anymore, unfortunately, but it does have incredible accomodations - wine, steak and Italian food. Keurig coffee makers, on site dining, fixed price meals and a full Ontario wine list. The private trails in the Haliburton Forest aren’t the only reason to stay and sled here, but they are a good one! A year round powersports destination, Shamrock is a well-known place within the area. They offer sled rentals and there’s easy access to the Park to Park trail. Considering they also do ATV and dirt bikes, this might be the best place for motorheads year round! An adults only resort with water spa and tasteful suites. Backcountry Tours offers sled rentals and guided tours, and full breakfasts here make the day extra nice. Incredible reviews aren’t the only thing that sets this place apart. The C104D is right here, and Near North Recreation rents sleds here too. If you want updates on trail conditions, check the Dun Ahmic Snowriders club on Facebook. For sledders travelling in couples, this place is perfect - hot tubs, fireplaces, lots of choices on the wine list - this is a great place to unwind with your significant other. They’ve also got fuel and oil, so you don’t need to worry about gassing up before heading to bed.